In the Hitchiker's Guide to the Galaxy it is vitally important that you always know where your towel is ... well it seems that in the First World War it was equally important that you always knew where your spoon was. After all, you could eat with a spoon, scrape mud off your boots with a spoon, dig yourself out of a collapsed dugout with a spoon, deflect bullets with a spoon and ... in the event of the ultimate sacrifice ... be identified by your spoon! I was adding details of one of our (the Barnsley War Memorials Project) men to Lives of the First World War the other night and (as you do) got distracted by the additional documents the Commonwealth War Graves Commission now supplies on the entries for the men. Lower down the page a second man, Pte R A Wood, of the 2/2 London Regiment was also identified by his spoon. I wonder how common this was? 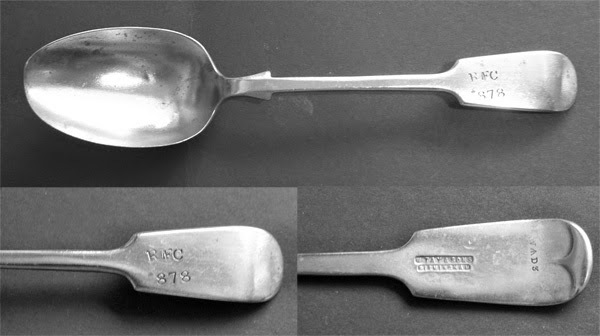 I searched online and was able to find this picture of a WW1 spoon on the Great War Forum where there is also a lot of discussion about the spoons. Walter Swift's Army Service Records have survived (available on Ancestry and Find My Past) and with those and a thorough search of the local newspaper, the Barnsley Chronicle (available to search digitally at Barnsley Archives) I was able to construct an interesting timeline around the spoon. Walter joins up in September 1914 no doubt carried along in the enthusiasm for creating a Barnsley Pals battalion at the beginning of the war. He was 29 years old. He had married Emily Walker in 1910 and they had two children alive at the time of his death, Elizabeth b.1912 and Walter b.1916. There had been another child, Arthur b.1910 who is listed on the 1911 census when Walter and Emily, living at 16 Park Square, off George's Street in Barnsley, declare they had been married 10 months and that Arthur was 6 months old. Interesting maths that! So Emily had been five months pregnant with Arthur on their marriage. Unfortunately Arthur dies later the same year and is buried in Monk Bretton Cemetery. Another child, Thomas is listed on Walter's Service Records, but he also dies young aged just 11 months in October 1915 and is buried in Barnsley Cemetery. His death certificate is included in Walter's records. Walter would still have been in England at this time, I hope he made it home to console Emily. Walter went over the top on 1 July 1916 with the rest of the Barnsley lads and was one of the hundreds of casualties from the two local battalions that day. Nearly two months later his family is officially notified that Walter is missing. The above note appears in the Barnsley Chronicle on 26 August 1916. Similar pieces continued to appear for many weeks after the events of the "Big Push" as it became known in the Chronicle. The following year the family must have heard more definite news as on two consecutive weeks In Memoriam notices appear for Walter, the first on 21 April 1917 from his mother, (step) father and sisters, and the one I have reproduced above on 28 April 1917, from his wife and children. There is a letter in the Service Records dated July 1917 noting that articles of personal property and medals should be sent to Mrs Emily Swift of 10 Mill Street, Hoyle Mill, Nr Barnsley. Emily remarries in 1918 to John W Jackson and moves to 52 Princess Street, Barnsley. They appear to have eight children together between 1919 and 1928. Emily Jackson was sent Walter's British War Medal and Victory medal in January and September 1921 following some letters to and fro to establish her whereabouts in late 1919. Emily completes the Next of Kin form in September 1919, which is wonderful source of family information for any family historian. She gives the full dates of birth of her and Walter's two surviving children and full address details of his mother, step father, and five half sisters, three of them under their married names! "890 York & Lancaster Regiment. It is desired to identify a soldier who bore the Regimental Number quoted above. Will you therefore kindly give the full description of any or all the soldiers in your records as having borne this number, and at the same time quote the latest casualty effecting him or them". The letter of reply has also been preserved in the records. You can see that the records office had identified five men in the York and Lancaster Regiment whose Service Number contained the digits 890. Three of them had survived the war and been discharged, one had been discharged in March 1915 - his number was 14/890 suggesting he was in the 2nd Barnsley Pals. At this date the Pals were still at home, the 2nd Pals having not even moved out of temporary accommodation in Barnsley centre (see Jon Cooksey's book Barnsley Pals for much more on the Pals' movements), so this man was probably discharged as unfit for service. Only 13/890 Pte Swift W was unaccounted for, "Assumed Dead. Place of Burial unknown". I assume the IWGC also considered the place in which the unidentified body had been found and that this tallied with the identification of the body as a man who had fallen on 1 July 1916. It would have been at this point the red ink correction was made to the Concentration document - and when Pte Swift's cWGC gravestone was engraved his full details were able to appear on it. You can see a low resolution picture of his gravestone on the War Graves Photographic Project's page. 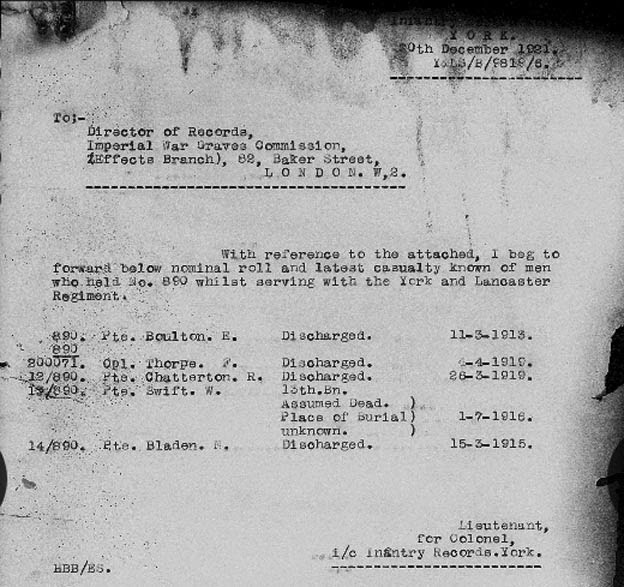 There is no family information on Walter's CWGC entry page and no personal dedication on his gravestone. This might be because the Army were having trouble locating his widow, or simply because she did not reply to them when approached. In February 1923 the saga draws to a close in, to me, a slightly shocking manner. 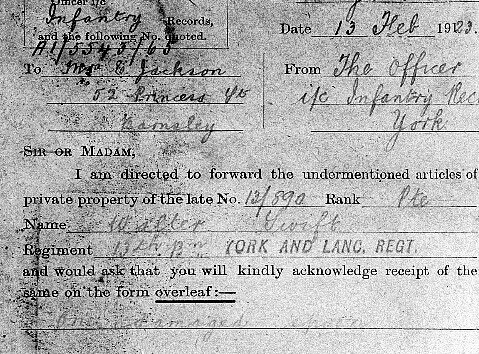 The Infantry Records Office sends "One damaged spoon" to Emily Jackson at Princess Street. It has been nearly seven years since Walter was reported missing. Emily has remarried and now has at least four children with her new husband. And then a spoon turns up. How upsetting must that have been? Emily and John William Jackson continue to live at 52 Princess Street for the rest of their lives. They lose two children, Edith aged 5 and Frank aged 4 at the beginning of 1931 who are buried in the same plot as little Thomas Swift (c 270) in Barnsley Cemetery. John dies in 1947 and Emily in 1977 aged 87 years old, they too are buried together in Barnsley Cemetery (6 101) and one day I'll take a walk and see if they have a gravestone. Such a long and sad life - and I wonder what happened to the spoon?